To schedule a lesson or series of lessons, please contact Jack at jwmontmeat@hotmail.com. Award winning Lyme Art Association Elected Artist and instructor Jack Montmeat is offering private lessons in drawing and painting this spring. You choose the subject matter and medium! 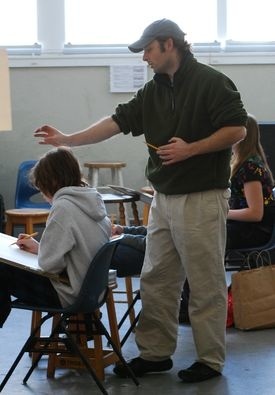 Individualized instruction will help artists of all levels improve their techniques. This is a time to work at a pace that is both challenging and comfortable. With proper guidance and critique, you will build foundations that will be profoundly reflected in your art. Please contact Jack at jwmontmeat@hotmail.com to schedule lessons. Instructor Bio: Jack Montmeat is an award-winning local portrait painter and illustrator with a studio in East Lyme, CT. Jack grew up in Old Lyme, and began taking classes at the Lyme Academy College of Fine Arts as a teenager. After receiving his BFA from the Columbus College of Art and Design in Columbus, Ohio in 2002, as well as studying in Paris and Florence, he began painting portraits full-time. Jack has received many awards for his portraiture, including winning first place in the Connecticut Society of Portrait Artists “Faces of Spring 2007” exhibition which was juried by renowned portrait artist Aaron Shikler. Jack is a three time recipient of the Elizabeth Greenshields Foundation Grant. He also recently received a Stobart Fellowship which enabled him to study independently in the museums of Paris. Jack has been teaching drawing and painting as well as monitoring at the Lyme Art Association since 2002. Jack is also an illustrator for Major League Baseball.